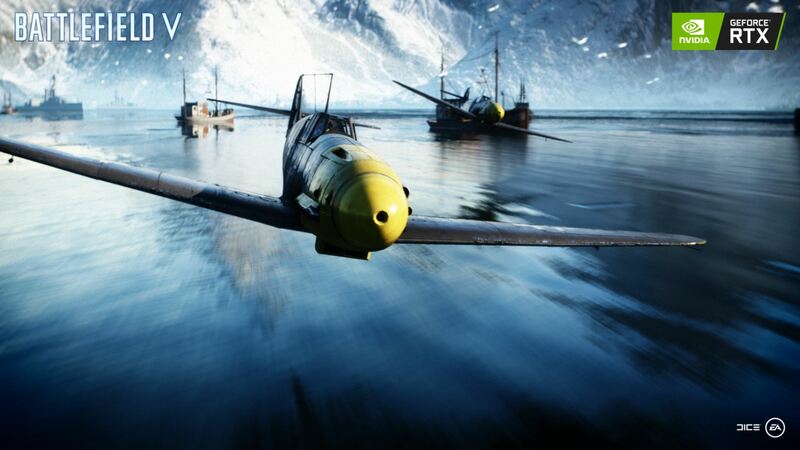 One of the most anticipated new games releases from DICE, Battlefield V, is set to release to the non-paying public on November 20th. Outside of being another AAA title in the long-running Battlefield series, the game was to include ray tracing capabilities which the new NVIDIA RTX series of cards support with their ray tracing cores. When the NVIDIA Geforce RTX cards released, we saw a lot of demos and the improvements were obvious and reflections are other ray traced surfaces looked beautiful. The question has always been the performance, but we can test that now. Though the game was supposed to include this anyway, early access through Origin’s Access program will allow us to see how these RTX series cards perform a few days before public release. Below is a screenshot of Jaqub (DICE)‘s twitter account stating that it can now be enabled in-game. Stay tuned for benchmarks to be added into this article as we get the game downloaded and find a nice place to benchmark. Finally, the RTX cards can flex their muscle – let’s see how it performs! Will there be a hack to enable RT on regular cards? RT requires an architecture change in the silicon of the GPU... if you want RT, buy an RTX card. But wasn't it mentioned somewhere that ray tracing can technically work on anything, but at extreme performance penalty due to not having dedicated hardware? As I understand it, the effect is done in software now, but it isn't nearly as accurate/looks good. This is real time ray tracing. Wait, Taco is confirmed, so they used to have it hardware rendered, but now its software rendered and just accelerated by hardware, which makes it realtime feasible feature, but because its software rendered it doesn't.look as hood? This is so confusing this tracing! I've been trying to get systems up to bench (wrong os, DL 44GB), and benched with a 2070. It depends on how much RT is going on. In the single player, there are 3 campaigns. The first two it ran 60 fps on ultra settings with RT enabled, doubled that+ without. The last one it was 30 fps and 41 fps. Still would be pretty neat to see just a demonstration how bad it would actually run on regular non rtx card. I was hoping to download a demo or something, fire it up and have it play like a picture frame on big screen driven by gtx460. New frame every 5 seconds would be perfect! That's the interval I find most pleasing when I have my photos cycle. Finally found out why my 2080 didn't work!!! WHen using the 2070, I disabled an option named "GPU MEMORY RESTRICTION". This setting 'may use more PGU memory than what is available and could comprimmise the stability of the game'. When that option is disabled, I cannot swap cards out (tried 2080 Ti as well). If I disable that option, I can swap in whatever card I want. Still would be pretty neat to see just a demonstration how bad it would actually run on regular non rtx card. This isn't possible AFAIK. In order to run RT on this game, you need a compatible OS, the game updated fully, and a card with that ability. There are other ways to test this, like in rendering applications, but not with the game AFAIK. That...That's an option? Why? Especially if it causes known stability issues. Good article, but Im a bit far from getting an RTX for myself. Still is good to see EA is giving support for RT and is working better than what I was expecting for an initial release. Also Nvidia needs to polish RTX drivers since they are still new tech. Anyone try using different video settings? I was wondering if the RT process was completely parallel.. If the processes are completely parallel then there may be almost no difference in performance, which would be interesting in-deed. 30 fps and 41 fps @1080p on a $500-$600 card is pretty weak, IMO. All things considered, though, it doesn't look bad overall. I assume BFV is more demanding than my games, but the numbers without RT look in line with what I get with my 1070 (the HOF. The reference card is definitely behind that). Eh I'm not too surprised. It's flashy new tech, it'll take a generation or two before the frame drop isn't as much. NVidia was probably just trying to pull a "First To Market" move which is why they introduced it with the 2xxx line.